After lots of rumors and leaks, the day arrived when Nokia finally unveiled a couple of Android phones at the Mobile World Congress 2014. Nokia has already achieved a steady growth in market from the sales of Windows Phones and it seems that they want to use Android to emerge faster in the market. 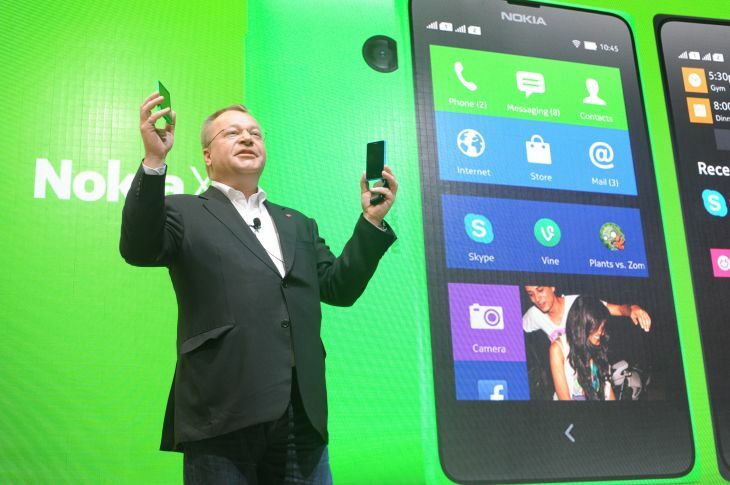 Well, Nokia released three Android devices which includes the Nokia X, Nokia X+ and the Nokia XL at the event. However, like the other Android devices, these Nokia Android devices doesn’t use the Android distribution backed by the licensed modules from Google such as Google Play, Gmail etc., but instead Nokia has used their own Microsoft cloud service. Both the Nokia Android phones i.e. the Nokia X and Nokia X+ are capable of running Android applications as well as delivering the special Nokia experience, including the popular Microsoft service. Both Nokia X and Nokia X+ are similar in appearance, they only differ in internal specs. We will discuss below the specs, features and more about the Nokia X and the Nokia X+. Nokia X and Nokia X+ continues the trend of pattern of bold and vibrant colors and adopts the similar design from its family. Nokia X and Nokia X+ shares the similar designs like the Asha and the Lumia line up and are made up of durable plastic. Both the handsets are similar in appearance, but the Nokia X+ differs in terms of additional memory and internal storage out of the box. Nokia X and Nokia X+ features Nokia’s renowned handset quality and design, with a fresh, tile-based user interface inspired by Lumia family. Nokia X and Nokia X+ has a similar button (a back key) like the new Asha phones (Asha 501,502,503) on the front side of the phone and has Volume keys and a Power/Lock key on the right side of the phone. Nokia X and Nokia X+ sports a 4-inch IPS WVGA capacitive display with 80ox480 pixels resolution, and it appears pretty decent especially for its price level. For any phone, display is the main component and it seems that Nokia has done a good job on it. Display features include Brightness control, Tactile feedback, Orientation sensor, Nokia Glance screen, Wide viewing angle and Screen double tap. Nokia X and Nokia X+ features a 3MP camera for capturing pictures and videos with a camera resolution of 2048 x 1536 pixels. There is no Flash. The phone captures decent pictures and is good for those who are not focussed much on camera while searching for a good phone. Nokia X and Nokia X+ are powered by a dual-core 1GHz 8225 Qualcomm Snapdragon processor that will run the proceedings inside the phone. Both Nokia X and Nokia X+ differs themselves only in terms of memory which affects there price too.Nokia X features a 512MB of RAM while the Nokia X+ features a 768MB of RAM. Well, that is obvious more the RAM faster is the access. Both the devices comes with 4GB built-in storage which is expandable up to 32GB using a microSD card slot. This storage space is enough especially for a low-end smartphone. Connectivity features includes the Bluetooth 3.0+ HotSpot, WiFi 802.11 b/g/n, a USB 2.0 support and a microUSB port for charging. Nokia has built the Nokia X and Nokia X+ on open source Android software, but they intends to make a difference to their customers by introducing popular services such as Skype, OneDrive as well as Outlook.com. Nokia X series comes with a different user interface and for a new user especially for an Android as well as Windows user, they will find some time to adapt and learn. First things users should be aware of is that Nokia has used the Open Source version of Android (4.1 JellyBean) in the Nokia X series device. So, the Android devices which we know is a combination of Open-source and closed source from Google, and the closed source part makes the Android what it usually looks like. As we mentioned previously, Nokia Android devices doesn’t use the Android distribution backed by the licensed modules from Google such as Google Play, Gmail etc instead they use the Microsoft Cloud service. So, what about apps and games? Well, that’s not a worry as the apps run like they would on a regular Android handset. But if you are thinking that for downloading apps and games, users should head over to Google Play Store to download it then let me make you aware that users have to head-over to the Nokia Store for downloading apps and games instead of the Google Play Store. There are chances that the Nokia Android app store will be a subset of the Google Play Store. Both the devices comes with Fastlane like the new Asha phones, which allows users to switch between their apps more smoothly. Also, these Android devices offers a great gaming experience with wide variety of games pre-loaded and available on the Nokia Store. Both the Nokia Android devices comes with Nokia Here Maps which provide an offline access of Maps unlike the Google and Bing Maps. Nokia MixRadio is a personal radio station that lets user play the music which they want to hear. This app updates new songs everyday and inspires you everyday and mixes based on he artists which you love. This is an all new app and requires no sign up and no subscription, so users can just enjoy the music. Nokia X and Nokia X+ comes with a 1,500mAh battery and provides a long battery life. Well, users will surely trust Nokia whenever there is quest on battery as Nokia devices has always provided a decent battery life since past many years. Nokia X will be rolling out soon in in Asia-Pacific, Europe, India, Latin America, the Middle East and Africa markets at a price of 89Euros, while the Nokia X+ will be arriving few months later in the second quarter of the year for 99Euros. Well, Nokia seems to target mid-range market first as they have not yet mentioned its availability yet in the United States. Both the Nokia X and Nokia X+ will be available in bright green, bright red, cyan, yellow, black and white colors. Well, Nokia X and Nokia X+ appears quite decent and will be affordable to a common man as it is designed by addressing the emerging markets in mind. Also, in terms of hardware both the phones will be quiet decent. If these Android phones by Nokia creates a mark on the market, then we will surely see a growth of high-end Nokia Android phones in future. Leave your comments below about these devices. Stay tuned for more updates.